A powerful bike needs a skilled rider. That’s why we offer training through the Honda School of Motorcycling (HSM). The HSM is a school where you can benefit from years of experience and highly skilled teaching. We will supply you with one of our training bikes and all the equipment you need. we will get you ready to take on the road and make the most of the whole Honda range with a nationally recognised licence. If you book a step up course now, our special offer can get you closer to owning a Bigger Honda bike of your own. Our qualified instructor, Tim, can get you up to A2 or A standard. That means a lot more choice when it comes to your ride. 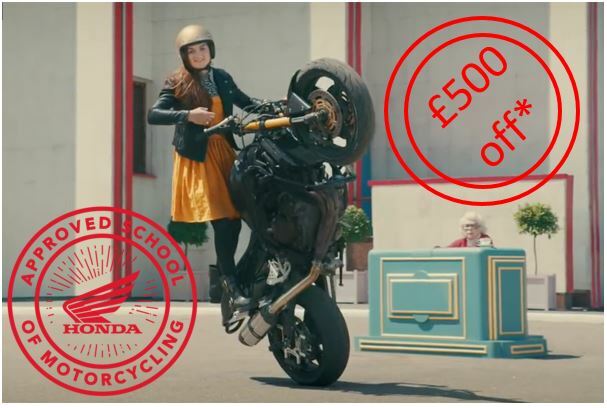 If you register now and pass a step-up course, not only will you get a nationally recognised licence, Honda will give you £500 towards a new bike. Fill in the online form and register for your unique code. Quote your unique code to your local dealer when booking a course. Pass our Step Up course and receive £500 towards any new Honda bike above 125cc.